App Roundup: Bear, Fortnite, Things 3, Halide, Jamf, RemotePC, more! The iOS and Mac App Store are constantly updated with new apps and updates to existing software on a daily basis, and it's difficult to keep track of it all. 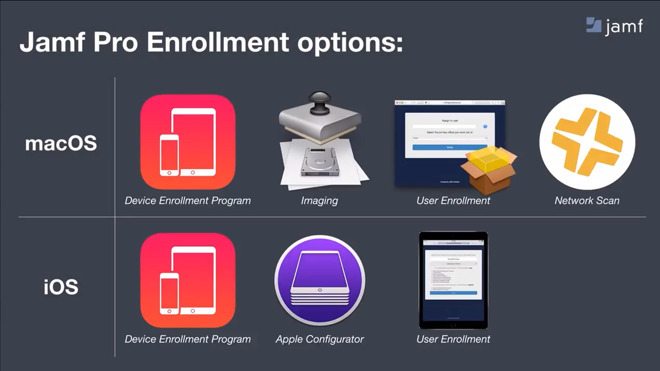 AppleInsider highlights some of the more notable app changes that have taken place over the last week. This week's highlights include updates to Bear, Halide, Jamf, PCalc, Things 3, OmniFocus 3, RemotePC and new items in Fortnite. Version 1.6 of the iOS version of Bear gains support for Siri and Siri Shortcuts from iOS 12, adding the ability to search and view notes from the last week, create notes with specific titles and tags, and other actions just from vocal prompts. A new Quick Nav option lets users quickly move around a document, which can be summoned by tapping two fingers in the Editor on any note. Swipe with two fingers in the Editor to skip the menu and to get straight to navigating. There are also changes to header linking, more transparent synchronization for Bear Pro users, scroll and cursor position saving when switching notes, new themes, 16 extra TagCons, and 14 iMessage stickers. Get it for iOS: Free. Requires iOS 9.0 or later. 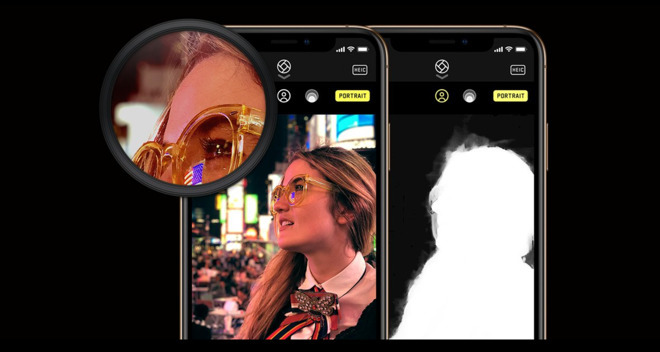 On top of last week's new Tech Readout feature, the photography app Halide has updated to take advantage of hardware features in the new iPhones and software ones in iOS 12. The tent pole new addition is what Halide calls Portrait Matte which uses Apple's segmentation. The iOS feature that lets you adjust the blur on the background is here adapted to help with fine details such as hairs. This update also adds Siri Shortcuts and the company gives the example that you can call out "Hey, Siri, first the shutter" —and Halide will take a shot. Get it for iOS: $5.99. Requires iOS 12 for the new features. With Apple discontinuing Back to My Mac this month, those looking for a way to access one's Mac remotely can find a solution with IDrive's RemotePC. The service allows you to connect to a PC or Mac from anywhere with TLS v 1.2 / AES 256-bit encryption. 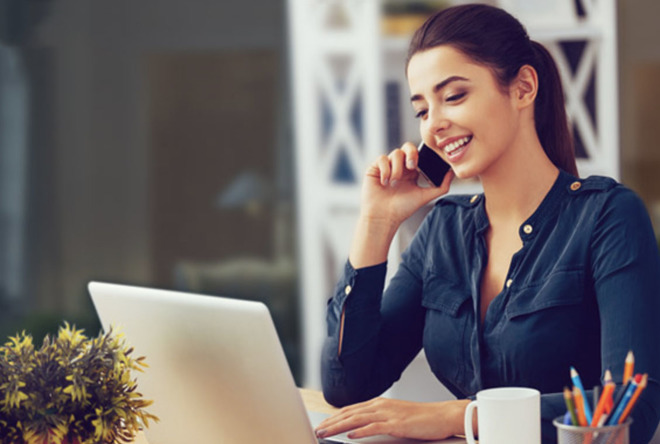 RemotePC also supports access from any iOS or Android device — and the service allows you to record remote sessions. Get it for Mac: RemotePC website. AppleInsider readers can take advantage of 90% off the service for your first year, bringing the price down to $6.95 for 50 computers. Device management service Jamf has been updated to support iOS 12 and tvOS 12 and reports that it will be ready for macOS Mojave when that releases on September 24. Jamf is a large-scale management service that lets companies handle dozens, hundreds and thousands of iPhones or other Apple devices for their staff. In the Jamf Pro version, the updated and improved features include optionally restricting iOS 12's AutoFill feature. This is the Apple feature that can offer to enter information from iCloud Keychain or a third-party password manager. With Jamf, your company's IT staff can limit the feature to minimize sharing sensitive data. 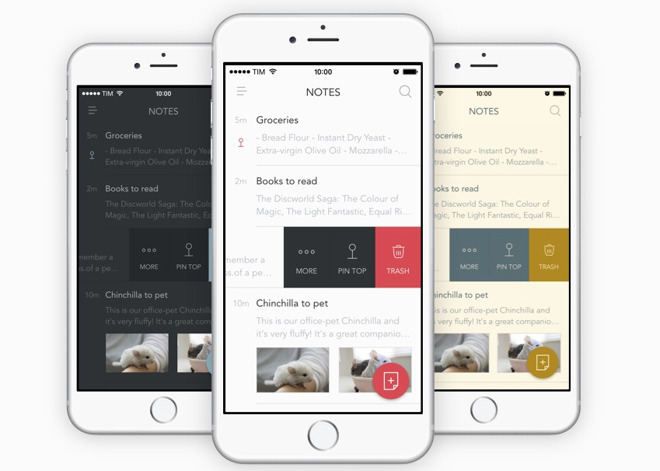 Get it for iOS and Mac: Jamf website. This is a large-scale company and corporate service with pay tiers to match but pricing begins at $2.99 per month per device. 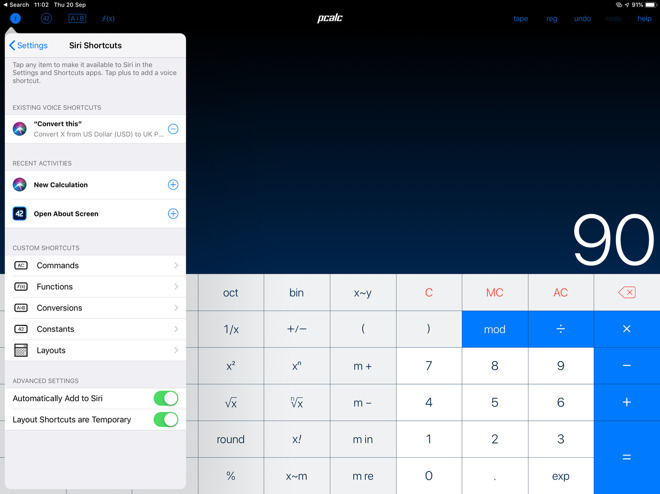 PCalc is one of the gems of both Mac and iOS: it is an extremely powerful calculator. It's also always at the forefront of new iOS features: it even added some Augmented Reality options when Apple first introduced ARkit. Now it's adopted Siri Shortcuts and done so with its typical thoroughness and even cleverness. You can't use Siri Shortcuts to pass information to an app: you can only use it to launch items or request details. Yet if you type a number anywhere on your iPhone and then copy it, PCalc will use that as if you entered it into the app. So copy "1,000", for instance, and then you can use Siri Shortcuts to ask PCalc to convert that from dollars to Euros. Get it for iOS: $9.99. Requires iOS 12 or later for the new features. Things 3 is one of the most powerful To Do apps for iOS and Mac. One reason it's so good is that it keeps exploiting new Apple features to improve how you get your tasks into and out of the app. The aim is to make it fast for you to enter a new To Do and at least as quick to see what your next task is. This update has sundry fixes but it's primarily about adding Siri Shortcuts. You can now add a new task or see a list of your To Dos with just a voice command. Things has long worked with Siri but it's always been a little bit of a fudge and this is like having access to Things directly. Get it for iOS: $9.99 for iPhone, $19.99 for iPad. Requires iOS 12 or later for the new features. OmniFocus is another of the most powerful To Do apps available and it, too, has added Siri Shortcuts. One of the app's best-known features is its Forecast view which tells you everything happening today from tasks that you must do, tasks that you could do and also all your calendar meetings. You can now just say "Forecast" to Siri Shortcuts and see all of this information. There are other minor updates and fixes. Note that the features of this release are coming to the separate Mac version on September 24. Get it for iOS: from $39.99. Requires iOS 12 or later for the new features. The Battle Royale-style game with construction elements has gained two changes that apply to the mass multiplayer mode in version 5.4.1. The Playground section has gained the Spiky Stadium, which when thrown, creates an arena. There are no defined rules to the stadium's use, allowing it to be used for practically any type of game players can come up with using the game's built-in functions. For standard gameplay, the Port-a-Fortress can save users from spending too much time while building, by instantly creating a tall vantage point anywhere it is thrown. Just launch it, and a tower appears with plenty of protection and with relative ease of access to all sides from the top. Get it for iOS: Free. Requires iOS 11.0 or later. Get it for macOS: Free (but with optional paid passes and a PvE campaign).